The United States Navy has sent a group of warships to waters near the Korean Peninsula as a show of force to North Korea. 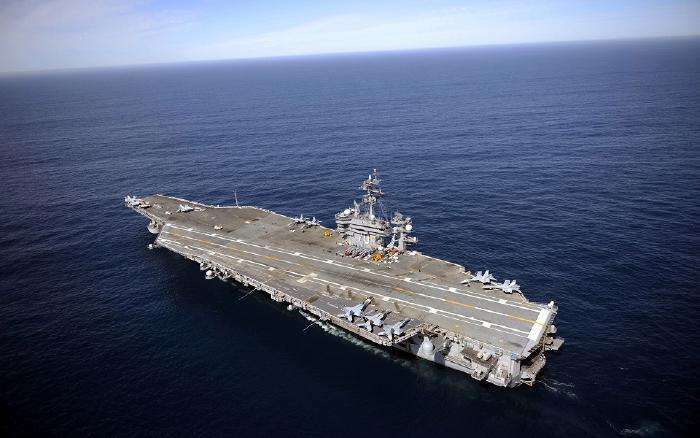 The strike group is led by the USS Carl Vinson aircraft carrier. It includes two guided-missile destroyers, a guided-missile cruiser and an attack submarine. After stopping in Singapore, the strike group had planned to move on to Australia, but was ordered to head north instead. A spokesman for the U.S. Pacific Command, Dave Benham, said the move was a "prudent measure to maintain readiness and presence in the Western Pacific." Benham said currently the number one threat in the region is North Korea. Pyongyang continues a "reckless, irresponsible, and destabilizing program" of missile tests and nuclear weapons development, he said. U.S. National Security Adviser H.R. McMaster said President Donald Trump had asked him and other officials to provide suggestions for removing the threat of a nuclear-armed North Korea. McMaster told Fox News that options will be considered "to remove that threat to the American people and our allies and partners" in the area. He added that Trump and Chinese President Xi Jinping agreed during their meeting last week that North Korea's "provocative behavior" was unacceptable. The strike group deployment to the Korean Peninsula comes after American missiles struck Syrian military targets last week. The airstrikes followed a deadly chemical weapons attack blamed on Syrian forces. The Tomahawk missiles fired into a Syrian airfield were launched from the USS Porter – a guided-missile destroyer deployed in the Mediterranean Sea. U.S. Secretary of State Rex Tillerson said the military strike against Syria was a warning to other countries, including North Korea, that "a response is likely" if they present a threat. Tillerson told ABC News this would include nations that "violate international agreements, fail to live up to commitments" and become a "threat to others." A South Korean Defense Ministry spokesman said he considers the strike group a response to the "serious situation on the Korean Peninsula." North Korea has fired off several test missiles in recent months and is reportedly planning another nuclear test. Many nations, including ally China, have condemned the tests. The United Nations has also demanded that North Korea give up its nuclear arms program. On Monday, South Korea and China said they had agreed to place stronger sanctions on North Korea if it continues nuclear and missile tests. The agreement was reached during talks between the top nuclear negotiators from both countries. North Korea is already subject to sanctions ordered by the United Nations Security Council. South Korea's negotiator told reporters the latest discussions did not include the possibility of a military response to North Korea's continued testing programs. North Korea has promised to strengthen defenses against airstrikes like those carried out in Syria. A North Korean official said those attacks proved that the North needs nuclear weapons to protect itself against America's "ever more reckless moves towards war." The aircraft carrier has been docked there since last month. This time we got a serious situation. 1.The airstrikes followed a deadly chemical weapons attack blamed on Syrian forces. President Hussein called on all countries in the Middle East to scrap nuclear or chemical weapons. The two leaders also approved treaties to cut stockpiles of chemical weapons. 2.The Tomahawk missiles fired into a Syrian airfield were launched from the USS Porter – a guided-missile destroyer deployed in the Mediterranean Sea. The police fired into the air in an attempt to disperse the crowd. He fired into the air, hoping that the noise would frighten them off.